A round table will take place in the framework of the PACE/EU Joint initiative to support parliamentary institutions and the PACE action "Parliaments united in combating domestic violence against women". This round table will be held on the premises of the National Assembly of the Republic of Serbia,with Ms Gülsün Bilgehan, Chairperson of the Committee on Equal Opportunities for Women and Men of the Parliamentary Assembly of the Council of Europe, Mr Lluis Maria de PUIG, member of Pace, Ms Darinka Stancheva, member of Pace, and Ms Gordana Čomić, member of the National Assembly of the Republic of Serbia and contact parliamentarian for Serbia (Draft agenda). 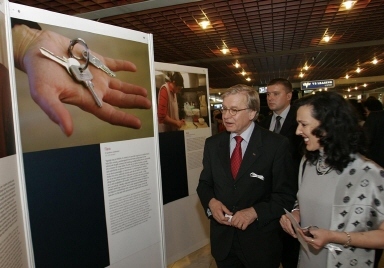 Opening of a Photo exhibition "Break the silence on domestic violence"
The Serbian version of the photo exhibition "Break the silence on domestic violence" will be inaugurated on 24 May at 1 pm in the Sava Center, with M. René Van der Linden, President of the Parliamentary Assembly of the Council of Europe, and the Speaker of the National Assembly of the Republic of Serbia (link to the virtual exhibition).